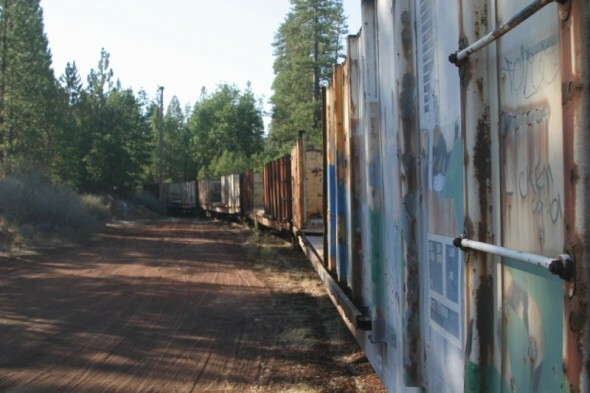 The McCloud River Railroad looked at leasing or purchasing interchange freight cars several times during its history, but each time the return on investment was not considered high enough to warrant the investment. The late 1970’s were marked by a supposed shortage of modern useable boxcars in the railroad industry. Several rail industry groups argued for and got the Interstate Commerce Commission to approve the concept of incentive per diem boxcars. The concept was to establish new, higher per diem rates for modern boxcars as an incentive for railroads to invest in new boxcars. Very few small railroads had the available capital to invest in new cars. However, several leasing companies were created to provide the necessary capital for new cars. A typical arrangement between one of these leasing companies and a railroad was that the leasing company would own the cars and lease them to the railroad; the railroad would pay a base lease rate to the leasing company for each car, and a portion of per diem revenue earned by the railroad would also be turned over to the leasing company. Many smaller railroad companies found it economical to have interchange freight equipment for the first time in their histories under these arrangements. Lumber roads were especially pleased with these arrangements, as they allowed the railroads to provide decent, modern freight cars for their lumber shippers that also happened to produce some additional income while not on home rails. 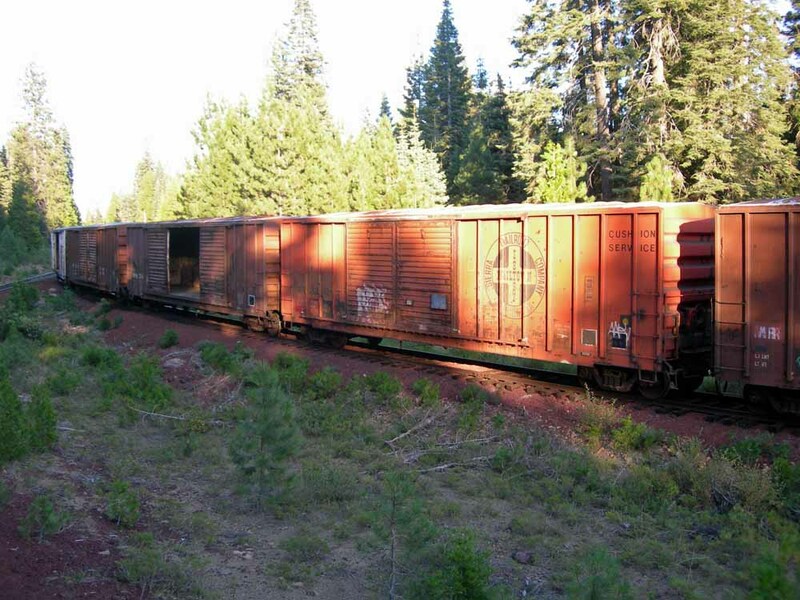 The McCloud River Railroad did not initially get into the per diem boxcar business. The McCloud of the mid-1970’s was still a major hauler of boxcar traffic with a large shop building. Both of these factors attracted the interest of Itel Rail, one of the leasing companies taking advantage of the per diem boxcar craze. The end result was that Itel successfully purchased the McCloud River in the first part of 1977. One of Itel’s first acts was to supply the McCloud River with 400 of its own boxcars, numbered 2000-2399. The boxcars were built by FMC in Portland, OR during August of 1977. Some went to McCloud first to be loaded and shipped out, but most went directly into revenue service around the rail industry. The boxcar boom eventually went bust, as the incentive per diem concept was found to be illegal and abolished. With lower per diem rates and a generally lackluster economy, many of the new boxcars added to the nation’s rail fleet during the mid- to late 1970’s were no longer needed. The end result was that many basically brand new boxcars were returned to their home roads for storage. Itel leased boxcars to several western shortlines, and as the 1980’s dawned many of these other roads started turning the boxcars back to Itel. Itel sent most of these cars to the McCloud River to be stored until better times prevailed. Boxcars formerly leased to the Anhapee & Western, Sierra, Camino Placerville & Lake Tahoe, Seattle & North Coast, Arcata & Mad River, and several other railroads made their way to McCloud to be stored. Many of these boxcars were entered into the McCloud roster and given McCloud reporting marks and numbers. These boxcars were sent back out when they could be, but a lot of them ended up spending most of their time in storage on McCloud sidings and spurs. The McCloud rostered close to 2,000 boxcars at the dawn of the 1990’s. However, in early 1992, the boxcars (along with all other railcars owned by Itel) were sold to GE Capital. GE Capital continued a contract with the new McCloud Railway to store and repair the boxcars as necessary, and through the mid-1990’s the railroad patched up and shipped out a lot of the boxcars, relettering them for the Texas, Oklahoma & Eastern railroad in the process. By the late 1990's a few more than 100 boxcars remained on McCloud trackage, stored either in McCloud, on the Pondosa branch remnant, or at Hambone. In the early part of 2006 GE Capital finally started removing these boxcars. The McCloud Railway moved these cars out to the Union Pacific, who took them north. The final destination for these cars was Mandak Scrap Metals in Manitoba, Canada, where they are being cut up at the rate of several each day. The steel then went to the nearby Gerdau Ameristeel rolling mill for recycling. 2000-2399: XM-class, 50-foot, double door boxcars, blt. May/June 1977 by FMC in Portland, OR. Purchased new by Itel Rail and leased to the McCloud River Railroad. A number of cars were lost in accidents; series further thinned by three subleases in 1980, as follows: 50 cars subleased 1/24/80 to Camino, Placerville & Lake Tahoe Railroad; 100 cars subleased 2/6/80 to Seattle & North Coast; and 100 cars subleased 8/29/80 to Sierra Railroad Cars in this series numbered 400 from 1977 through 1980; 149 cars in 1981; 144 cars 1984-1988; 139 cars 1989-1991; 97 cars in 1992-1993; 87 cars in 1994; 73 cars in 1996-2005; 34 cars in 2006; 6 cars in 2007; and 3 cars in 2008-2011. Ownership of the cars transferred to GE Railcar Services in 1991, with a handful of the cars subsequently conveyed to McCloud Railway as payment for shop work. The McCloud Railway dismantled one of these cars in 2006, with the body converted into two sheds around the shop area and the frame converted into a tender for crane #70. Some intact cars remain in service in 2011 but are registered to other railroads, including Iowa Terminal and Texas, Oklahoma & Eastern. 2400-2405: XM-class, 50-foot, double door boxcars. Built 2/1978 by FMC for Itel and leased to McCloud River Railroad. Same description and disposition as cars in the 2000-2399 class. Cars in this series numbered 6 until 1991, 5 cars 1991-2005, 4 cars in 2006, and 2 cars in 2007. Brand new McCloud River boxcars in the McCloud yard. Photo from the Travis Berryman collection. A tired looking MR #2034 in the McCloud yards. Photo by and courtesy of Peter Ely. Cayton, CA, circa 1988. One of the first 400 boxcars. Boxcar #2086 on the siding at Hambone in June 2004. Bear Flat, CA, 5/2003. One of the original boxcars, now owned by GE Capital, in storage on the remnant of the Pondosa branch. Bear Flat, CA, 5/2003. Close-up view of the logo on a boxcar. The frame of a boxcar in use as a tender for crane #70. 2500-2506: XM-class, 60-foot, single door boxcars. Leased 4/28/1983 from Itel. Cars stricken from roster by 1988. 3000-3999: XM class, 50-foot, double door boxcars. Itel originally leased these cars to Arcata & Mad River; 95 cars in this series leased to McCloud River on 4/28/86. Lease terminated 7/21/1986. A solid 90-car train of the ex-A&MR boxcars on the line between McCloud and Bartle. Travis Berryman collection. 4000-4098: XM class, 50-foot, double door boxcars. Itel leased 99 cars to be numbered in this series to McCloud River on 4/20/83; however, Itel only delivered cars 4041, 4080, and 4084 before terminating the lease for the remainder of the series. Car 4080 destroyed on 9/30/85; remaining two cars stricken from roster in 2005. In 7/87 Itel leased a group of 45 boxcars that were to be numbered into this series, but cars instead received MR 11125-11169. 4500-4599: XP, class 50-foot, double door boxcars. This fleet consisted of 100 cars originally from the MR 2000-2399 series subleased 8/29/80 to Sierra Railroad and renumbered SERA 4500-4599. Sierra terminated the sublease on 12/12/86, after which cars restored to McCloud roster with MR reporting marks and the Sierra numbers. McCloud River assigned these cars to Canadian National on 11/4/86. Cars in this series numbered 100 1988-1989; 99 cars in 1989; 98 cars in 1991; 97 cars in 1992; 95 cars in 1994; and 94 cars in 1996. No cars shown in this series 1997-2002, with 8 cars restored 2003-2005, 5 cars in 2006, and 4 cars 2007-2011. Sierra #4520 in McCloud. Dennis Sullivan photograph. 7000-7275: XP and XM class, 50-foot, double door boxcars. Cars 7000-7176 (177 cars, formerly leased to City of Prineville) leased 9/23/83 from Itel; cars 7177-7225 (49 cars, formerly leased to Camino, Placerville & Lake Tahoe) leased 11/4/85 from Itel; and cars 7226-7275 were originally MR 2000-2399 series cars subleased 1/24/1980 to Camino, Placerville & Lake Tahoe Railroad (CPLT 7850-7899) and returned 11/4/1985 to McCloud. Lease for cars 7187-7221 (35 cars) terminated 7/86. Cars in this series numbered 132 in 1984, 276 cars 1986-1987, 243 cars in 1988, 240 cars in 1989; 237 cars in 1991, 137 cars in 1992, 70 cars in 1993, 66 cars in 1994, between 53-59 cars 1996-2000, 51 cars in 2001, 50 cars 2002-2005, 26 cars in 2006, 7 cars 2007-2009, and 6 cars 2010-2011. In the mid-1980s the railroad placed two of the ex-CPLT boxcars on blocks, one for use as a storage shed behind the shop building and the other at Cayton for use as a loading platform by Dicalite. One of the former COP cars is on the Yreka Western, where it has been rebuilt into an open air excursion gondola. Bear Flat, CA, 5/2003. 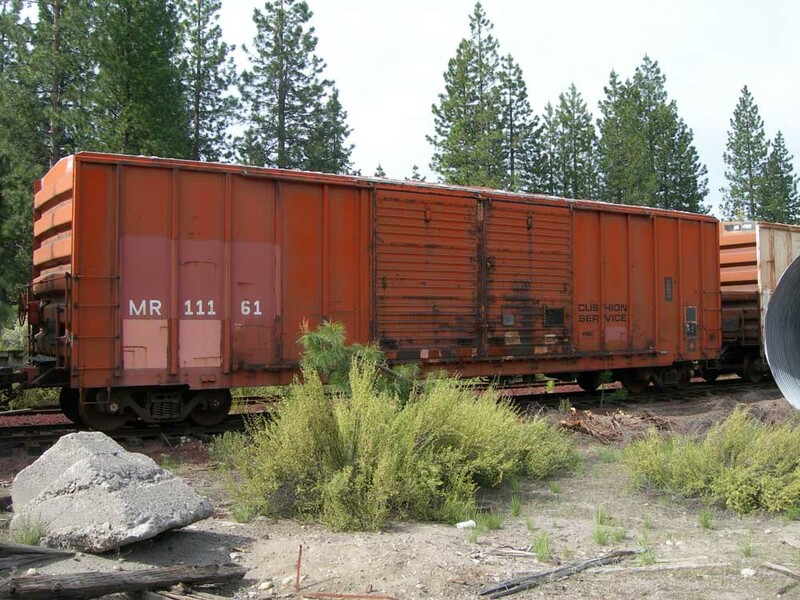 An ex-City of Prineville Railroad boxcar. Former Camino, Placerville & Lake Tahoe boxcar #7831 on blocks at Cayton. Jeff Moore photograph. 7700-7716: XP class, 60-foot, single door boxcars. 17 cars reported in 2001 only. 7800-7831: XP class, 60-foot, single door boxcars. 30 cars reported in 2001 only. 8000-8089: XM class, 50-foot, double door boxcars. Originally leased to Sierra Railroad. Leased 7/1/86 from Itel. Cars in this series numbered 88 1987-1989; 86 cars in 1991; 25 cars in 1992; 12 cars in 1993; 11 cars in 1994; 10 cars 1996-2005; and 4 cars in 2006. MR #8062 (ex-Sierra Railroad) in the siding at Pierce in August 2006 Jeff Moore photograph. 8700-8749: XM class, 50-foot, double door boxcars. Leased 7/1/86 from Itel. Cars in this series numbered 35 in 1987; 34 cars 1988-1991; 8 cars in 1992; 4 cars in 1993; 3 cars in 1994; and 1 car 1996-2005. 8750-8789: XM class, 50-foot, double door boxcars. Leased 1/87 from Itel. Cars in this series numbered 40 1987-1989, 39 cars in 1991, and 14 cars in 1992. 8790-8814: XM class, 50-foot, double door boxcars. 25 cars leased 1/87 from Itel. Cars re-numbered MR 11100-11124 by end of 1987. 11000-11099: XP class, 50-foot, double door boxcars. 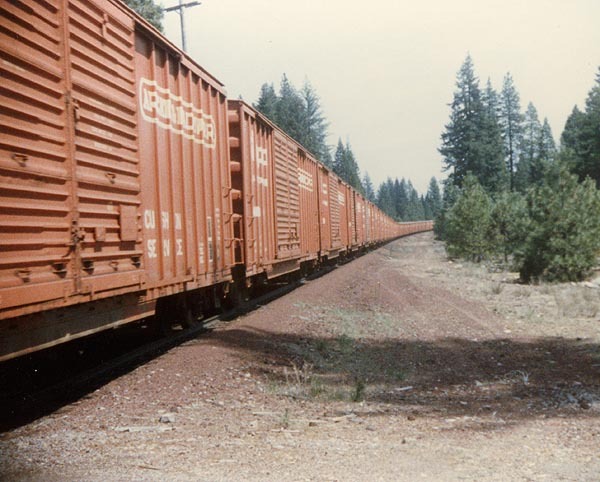 Originally McCloud River 2000-2399 series boxcars subleased 2/6/80 to Seattle & North Coast Railroad (SNCT 1000-1099). Cars repainted solid brown by SNCT. Cars restenciled 9/30/82 to MR 11000-11099 following modification of sublease terms. Sublease terminated 2/22/85 due to SNCT default and cars fully restored to McCloud roster. Cars in this series numbered 100 1984-1986; 98 cars in 1987; 97 cars in 1988-1989; 77 cars in 1991; 57 cars in 1992-1993; 54 cars in 1995; 45 cars in 1997-1999; 43 cars in 2000; 42 cars in 2001; 40 cars in 2002-2005; 26 cars in 2006; 7 cars in 2007-2008; and 6 cars in 2009-2011. Bear Flat, CA, 5/2003. An ex-Seattle & North Coast Railroad boxcar. Notice how the McCloud logo has been painted over on the ex-McCloud River boxcar to the left of the S&NC boxcar. 11100-11169: XP class, 50-foot, double door boxcars. Cars 11100-11124 originally MR 8750-8789, leased 1/1987 from Itel; Cars 11125-11169 originally Hartford & Slocomb #4000-#4099 series, to Ahnapee & Western 1978 (same numbers). H&S leased 25 cars to Crab Orchard & Egyptian (COER 1400-1424) in 1984. McCloud River leased 45 of these cars from Itel in 7/1987 and originally intended to keep them in the 4000-series, but instead assigned them 11125-11169. It is possible, though not confirmed, that MR 8790-8814 (11100-11124) may the old COER cars. McCloud River assigned these cars 7/1987 to Illinois Central Gulf. Cars in this series numbered 70 1987-1989, 69 1991-1993, 68 cars in 1994, 67 cars in 1996, 66 cars 1997-1999, 64 cars 2000-2004, 12 cars in 2005, 11 cars 2006-2008, and 3 cars 2009-2011. One car (MR #11138) sold to Modoc Railroad Academy, and others conveyed to Pee Dee River Railroad. MR #11161 at Ash Creek Junction in June 2008. Jeff Moore photograph. 178882-178956: XP class, 50-foot, single door boxcars. Originally Soo Line cars. Itel leased the cars to the Green Bay & Western on 5/10/1979. McCloud River subleased these cars from GB&W from 12/15/1986-1/1/92, at which time Itel leased the cars directly to McCloud River. McCloud River immediately assigned the cars to Canadian National. Cars in this series numbered 75 1987-1994, 74 cars 1996-2003, and 72 cars 2004-2005. Remaining cars transferred to Golden Triangle Railroad 3100-series by 2006. Bear Flat, CA, 5/2003. Uneven snow melt on the car roofs has a habit of gradually tipping the cars over. Here is one starting to tip. Bear Flat, CA, 5/2003. This is one of several boxcars stored on the branch that were laying completely on their sides as a result of the uneven snow melt off of the car roofs. The great winter of 1992-1993 tipped over more than 20 boxcars stored on the Pondosa branch, as well as several more stored on the Bartle siding. This is one of several such tipped cars that had to be cleaned up before the cars could be pulled out of storage and sent off to the scrappers in the late summer of 2008. A healthy cut of the GE Capital boxcars starting their final journey in late April 2006. Photo by and courtesy of John West. As noted above, the McCloud Railway gained title to seventeen boxcars as partial payment for shop work the company did for GE Capital. The railroad cut six of the cars down to gondolas for help in the salvage efforts during the summer and fall of 2008. These six cars, plus the others, remain in McCloud and are likely to be scrapped. Pat Driscoll photograph.